They exist two ways to scaling up the biomagnetic separation conditions from laboratory scale to production (or from millilitres to tens of liters). The first one is to use the same magnetic force at small volume than we will use at the final scale. Advanced biomagnetic systems are usually presented in different families. 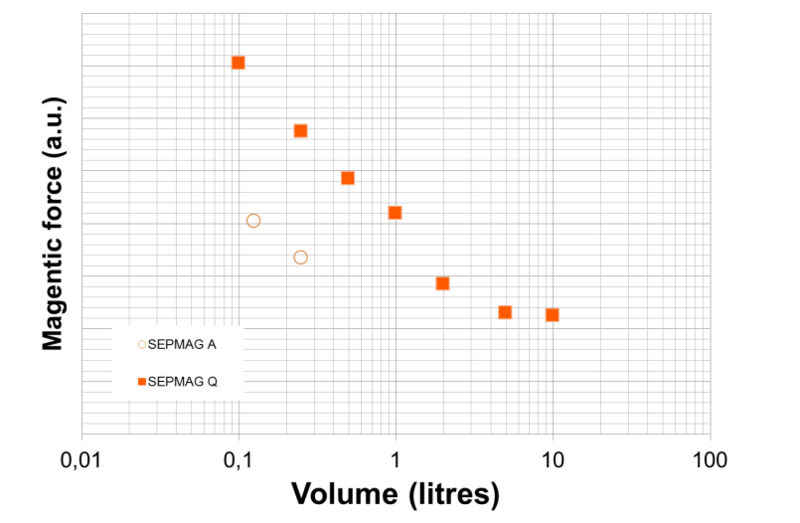 Is the case of SEPMAG® A and SEPMAG® Q. The A systems permits to work with volumes from ml to 125 or 250 ml (depending on the model) with the same magnetic force as 1 to 2 liters Q-series. Then processes developed in SEPMAG® A systems in milliliter scale, can be tested at 125-250 ml using the same device and then directly transferred to volumes of 1-2 liters just using SEPMAG® Q. However, this strategy is not always possible. The weight of biomagnetic separation systems augments faster than the working volume, making sometimes not economically feasible keeping exactly the same magnetic forces at all the scales. This is a typical situation on R&D, where the need to make as many separation as possible often leads to choose fast separation speed as the main criteria for selecting the small volume biomagnetic separation conditions. When the R&D phase is completed and the focus moves to manufacturing, the productivity is mainly driven by the batch volume, not the separation time (the separation time is just a fraction of the process: inserting/extracting the bottle, pumping-out the supernatant, adding the clean buffer, perform Quality Control test… all this operations would consume much more time). To keep the scaled-up process on a reasonable budget (and having a system with weight and dimensions fitting in the existing facilities) the key is to have the magnetic beads saturated. If the new force is enough to retain the beads while the supernatant is removed, the biomagnetic separation conditions would be the equivalent: the beads would be interacting with their neighbors in the same way as in the small volume, overcoming the thermal agitation. Having all the beads interacting as in the small volume guarantees that the chains would be formed –remember that fast separation is driven by this cooperative behavior- and the separation speed would be proportional to the gradient. Then separation time would be slower, but in the same range as the small volume. 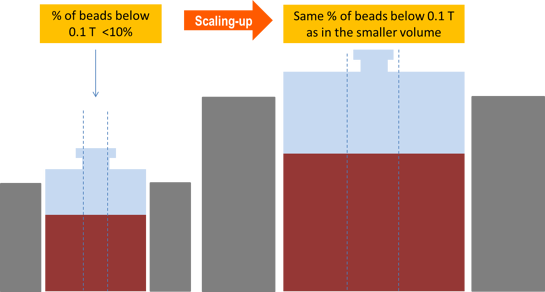 If we have a validated process with a separation time of 30 seconds, we can estimate the value when we scale-up to a 10 fold volume by using a vessel 2.5 higher and with double the diameter. Using a larger biomagnetic separation system, with half the magnetic field gradient (to keep weight and cost reasonable), the separation speed would be half the small scale. As the distance the beads need to travel is the double at large scale (the ration between vessel diameters), the new separation time would be 4 times the original one: 120 seconds (2 minutes). Note that the 90 seconds difference would be not relevant if you compare with 10-fold time you will need to pump-out the supernatant if you keep the extraction flow constant. As discussed, using advanced biomagnetic separation systems, with constant force, makes the scaling up straight-forward, just by using the same force value at different volumes or, when not possible, keeping the same magnetic beads state. This allows avoid risks when change scale, and guarantees the process scalability from millilitres to tens of liters.